Cable Trays are used in the electrical wiring of buildings. These Cable Trays are support insulated electric cables used for power distribution and communication. Our company is engaged in manufacturing and supplying these Cable Trays with efficient functionality. Cable Trays, offered by us, are available in a wide assortment of excellent finishes and materials as per the demand. Manufactured as per set standards, these Cable Trays are fabricated using mild steel, stainless steel and aluminum. 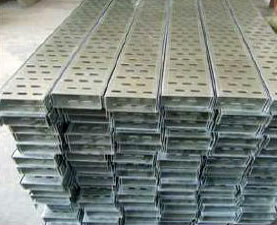 We make our Cable Trays available in pre-galvanized steel and hot dip galvanized. In addition to this, we also provide our Cable Trays painted with enamel paint or powder coat. We also manufacture clamps, connecting pieces, slotted angles for easy support and installation of cables over these Cable Trays. We offer a quality and wide range of Cable Trays manufactured in a variety of material and finishes. These are fabricated using mild steel, SS, Aluminum and can also be available in pre-galvanized steel and hot dip galvanized. As specified by our clients. We also provide these trays painted with enamel Paint or powder coat. Besides this, we also manufacture clamps, connecting pieces, slotted angles for easy support and installation of cables over the cable trays.